Shortly after turning forty years old Meryl Streep apparently declined the opportunity to play a witch on three occasions in quick succession. At the time she turned the roles down, claiming the time ‘wasn’t right’ for her to take on such a character. 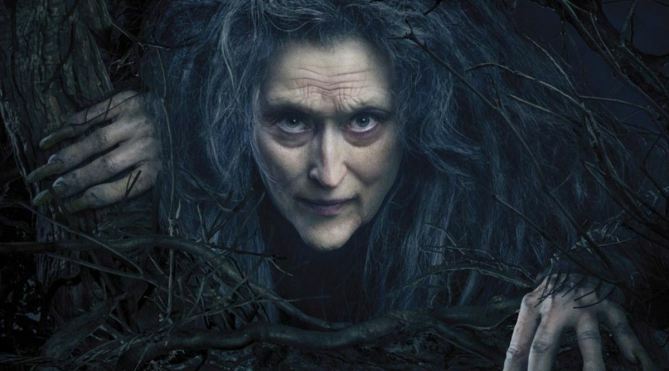 Well, it would seem that now the actress is in her late sixties, she has had a change of heart, as she takes on the role of the witch in Disney’s musical fantasy Into the Woods. Or perhaps it’s that she – along with it would seem everyone else involved in the film – couldn’t turn down the opportunity (no matter what part they were offered) to be in a film based on a Broadway smash-hit by legendary impresario Stephen Sondheim. Having watched the film viewers may understand why director Rob Marshall and a cast which – alongside Streep – includes Emily Blunt, Anna Kendrick, Chris Pine, Christine Baranski, James Corden and Tracey Ullman, were so keen to be involved: the story which cleverly intertwines a host of classic, much loved fairytales comes alive on the screen to a musical soundtrack which, though challenging, is equally magical. When a group of disparate characters from classic folklore – including Cinderella (Kendrick) and her Prince Charming (Pine), Jack (Daniel Huttlestone) of beanstalk fame and his mother (Ullman), Little Red Riding Hood (Lilla Crawford) and her lupine nemesis (Johnny Depp), a baker (Corden) and his wife (Blunt) who long for a child and the obligatory wicked witch (Streep) – find themselves lost in the woods, it’s anyone’s guess what will happen next. One thing for sure though – everyone will get the ending they deserve. Whether that’s happy or not remains to be seen. Audiences for this film will probably fit into one of three categories – Sondheim fans, fairytale fans and kids: the final group will most likely be taken along because their accompanying adult fits conveniently into one of the first two. Being a film which a) has been made by a host of talents most of whom are clearly ardent Sondheim aficionados, and b) has been produced by the archetypal fairytale studio, there was never much doubt that the result would more than satisfy the first two groups. As for children? Well, that sub-set may be a little harder to please. Like much of modern theatre music, that by composer Stephen Sondheim is very much an acquired taste which you will either love or hate. As is so often the case the music – and accompanying lyrics are acceptable in context and short bursts, but somewhat harder to take in two hour doses. That’s not to say Sondheim’s music and lyrics – based on the book by James Lapine – aren’t clever, but just that like all large scale musicals the memorable hits are interspersed by several which are less so. This is of little consequence however, as Into the Woods‘ marvellous casting of stars like Streep, who steals every scene in which she appears, Blunt who, as the well meaning if confused baker’s wife, proves just how versatile an actress she is and the wonderful Christine Baranski as Cinderella’s deliciously demented step-mother, more than helps liven proceedings. Dress this all in clothes by BAFTA nominated costume designer Colleen Atwood, and place the proceedings within a series of out-of-this-world settings by production designer Dennis Gassner and set decorator Anna Pinnock, and you have a film which will entertain viewers whether Sondheim fans or not. Where the other two audience categories – fairytale fans and kids – are concerned, the same pros and cons will likely be found by both. There is plenty here to satisfy lovers of both fantastical tales and classical fairytale elements such as witches, princesses, princes, giants and the obligatory ‘Big Bad Wolf’. However those expecting a Disney’esque ‘happy ending’ may be disappointed. Keeping more in tune with the true morality tale origins of the Grimm Brother’s and Charles Perrault’s fairytales, Lapine’s reworking of the stories may shock Disney purists as well as prove harder for younger audiences to accept, though are none the worse for teaching them that life doesn’t always end up happily ever after. Into the Woods may not be what audiences – from whichever grouping they fall into – will be expecting. However, as an example of the fantasies which filmmakers can concoct on the screen, the result is nothing short of bewitching.